Paper fresh off the truck needs time to acclimate. Did you know that paper is typically derived from cellulose pulp and the fibrous material from wood and grasses? In a way, paper is like a living, breathing thing. And like many living things, paper needs time to adjust to the changing circumstances of its environment. You will get the best results from your paper if you give it time to acclimate to ideal pressroom conditions. So how can you properly acclimate your paper for your pressroom? Here’s a quick guide. Temperature and humidity are the biggest issues when it comes to acclimating paper to your pressroom. Depending on its surroundings, paper will absorb and lose moisture. Paper that’s in transit to your pressroom is sometimes exposed to high humidity and extreme temperatures, which can result in converting problems. Generally speaking, you want your paper to be acclimated to a pressroom of 45-55% relative humidity and 68-77° Fahrenheit. Paper acclimation is not an instant process. When your paper is fresh off the truck it needs time to adjust to its new environment. 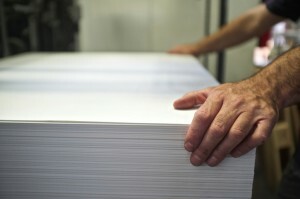 Paper should be given at least 24-48 hours to acclimate before being used in production. The exact timing is a function of the weight of the paper and the relative temperature/humidity difference. Heavier skids and paper with greater temperature differences will require more time to acclimate to your pressroom. Proper acclimation sometimes takes as long as 100 hours. When it comes to important projects, it’s better to be on the safe side. Paper that has been exposed to large differences in temperature and humidity will frequently curl, tighten or develop waviness around edges. Always store your paper somewhere dry and away from heaters. Avoid cold and damp concrete walls or wind. Practice first-in-first out strategy so that you’re always using older, better acclimated inventory first. Keep product in its original packaging until it’s ready for use, and only unwrap skids and rolls before printing and converting. Make sure to rewrap unused stock. Following good paper acclimation practices will help you avoid some of the converting headaches that can result from fluctuating humidity and temperature. This entry was posted on Tuesday, July 19th, 2016	at 4:46 pm	and is filed under industry practices	. You can follow any responses to this entry through the RSS 2.0	feed. Both comments and pings are currently closed.